Discover Oxnard's unique coastal setting and small town charm. Every year thousands of visitors and residents experience the culturally diverse flavor of Oxnard. The area’s sunny Mediterranean-like climate complements a wide variety of outdoor recreation and attraction venues, which are available year round. View breathtaking sunsets and vistas that the Pacific Ocean provides with the Channel Islands in the background. With miles of white sandy beaches Oxnard is a surfer’s dream and a sun lover’s haven, offering an array of sea activities such as sailing, kayaking and surfing, and land activities such as tennis, biking, golf and shopping. Festivals are commonplace in Downtown Oxnard and the surrounding area. Museums, theaters, symphony performances and community concerts add to the exceptional quality of life in Oxnard. Oxnard is a charming community by the sea, offering coastal beauty at its finest. The city is located on the beautiful Southern California coast just 60 miles northwest of downtown Los Angeles and 35 miles south of Santa Barbara. With a population of just over 210,000 Oxnard has a small-town atmosphere with all the advantages and culture of a big city. Residents of Oxnard enjoy a pleasant suburban atmosphere and a balanced economy, excellent health care, outstanding educational opportunities, a wide selection of retail shopping and an exciting range of restaurants and entertainment. The City of Oxnard is proud of its outstanding quality of life, wide variety of housing choices, low crime rate and the Chamber’s contribution to the community. Oxnard is an attractive area on the central coast for industrial and commercial development sector. 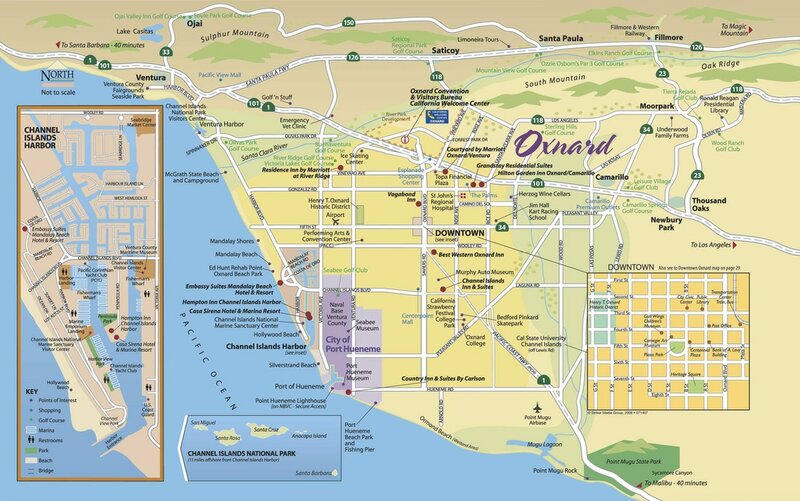 Retail trade, real estate, manufacturing and industry play a primary role in the regional growth of the Oxnard plain. One of Ventura County’s premier economic engines, the Port of Hueneme moves over 9.2 billion in cargo annually and creating 10,226 trade-related jobs. Naval Base Ventura County (NBVC) and its tenants directly employ more than 19,000 personnel (military and civilian) workers and is the largest employer in Ventura County. Oxnard is surrounded by some of the most fertile agricultural land in the world. More than 12,000 acres in Ventura County are dedicated to growing strawberries, primarily in Oxnard. Oxnard is a region with many employment opportunities in a variety of areas, such as retail, trade industries, health care services and educational institutions.